Whitewater Excitement has been offering river rafting adventures for 35 years. 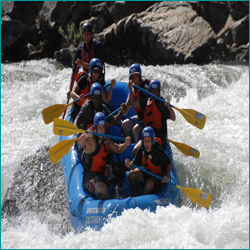 We have 4 great rivers to give you, our guest, the best options for your rafting experience. Fun, knowledgeable, safety conscious guides are the backbone of our company. Large company benefits with a family run small company atmosphere. Private riverside campground with dedicated camp hosts and cooks, make your experience with Whitewater Excitement the best it can be. Ask for our “Get to Know US Special”.